Lantek, world leaders in the development and marketing of CAD/CAM/MES/ERP software solutions for the metal and metallic structure industry, maintains its bullish trend of the last few years and foresees a growth of 15% in 2015, and a turnover of 16.2 million Euros, compared with the 14.08 million Euros of the previous financial year. This information was provided at its annual conference, Lantek International Meeting, which was held at the company’s headquarters in the Technology Estate of Alava. It was attended by people responsible for the different markets and offices in the countries where it operates, as well as high-ranking representatives from head office departments. Lantek, as underscored at the event, managed to achieve the highest turnover of the last decade this year and the fourth highest increase since 2004. Since then, the head offices with headquarters in Miñano, province of Alava, have increased their sales by 161.7%, going from 6.2 to 16.23 million Euros. Within a context of economic crisis, Lantek only recorded decreases in its sales volume in 2009 and in 2013. 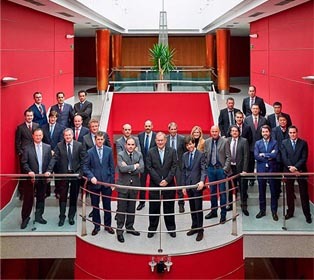 "Lantek has not only surpassed a negative international economic context with ease, but it has also come out stronger thanks to our investing effort, although we want to keep on improving our profitability even more in order to maintain international leadership in our market”, emphasises Alberto Martínez, manager of the multinational. In order to increase the sales this year, Lantek will commit to its integral software solution division. Thus, the aim is for its weight in the company turnover to reach 16%, representing 3 percentage points more than in 2014. However, the greatest weight in Lantek’s turnover continues to be its flagship, the CAD/CAM division, which accounts for 84% of the total, although this figure is 3 points less than in the previous financial year. 12% of the entire business generated by Lantek in 2014, corresponds to Spain, whilst the remaining 88% of the financial year’s revenue comes from Lantek’s international business. More specifically, the Alava firm’s subsidiary in Italy is expected to bill the most in 2015, increasing its turnover by 4%. In terms of turnover, it will be followed by the subsidiaries in Germany, South Korea and the US. The turnover of all the international markets will increase this year, above all, in Chile, US and Turkey, and with the exception of Canada. "Our success lies in continuing to commit to the internationalisation of the company, exporting our products to places where there is a potential demand, which makes us more competitive and allows the company to grow every year”, highlights Joseba Pagaldai, commercial director of the multinational. From the strategic viewpoint, Lantek is going to consolidate the loyalty policy of its more than 15,000 customers through a strong commercial boost of the maintenance contracts. Likewise, it wishes to tap into its global presence and its experience in many different markets to continue to add large corporations, operating all over the world, to its customer database. In its eagerness to continue attracting new customers, the commercial action is going to be fostered through new tools and campaigns in different countries that will provide the Lantek sales team with extra help to permit the corporation to reach its objectives in terms of sales and user satisfaction, and maintaining the quality.